Chert Hollow Farm on Organic certification, More Snow, Feed the Soil presentation. Chert Hollow Farm’s photos of their farm gate before and after. 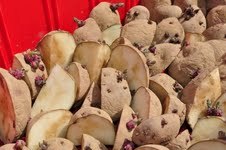 For some time I have been following the blog of Eric and Joanna Reuter of Chert Hollow Farm near Columbia, Missouri. I admire their commitment and creativity. 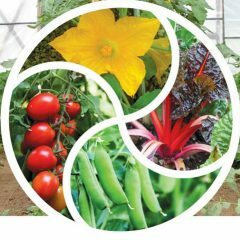 Recently they have posted a three-part series on why they have decided to drop their USDA Organic certification. I found it a very thought-filled and coherent piece of writing and want more people to read it and ponder the points they make. Dropping organic certification, part I talks about some of their concerns with the USDA Organic system as a whole, and how some of the Organic rules are increasingly at odds with their “beliefs and standards for sustainable and ethical food production.” Their work creating a diverse deeply-sustainable farm with minimal bought-in inputs isn’t easily reconciled with the USDA certification process. “Trying to use our own resources in a creatively sustainable way created an unusually-shaped peg that the organic system’s round holes don’t expect. And thus there’s a lot of subtle pressure on organic farms just to buy stuff rather than be more diversified and creative in their farming approach.” According to their Organic inspectors over the years, they have been star poster-child Organic farmers for five years, and their decision to leave Organic certification will be “a major loss to the organic certification community/process in this part of the country”. In addition to the differing philosophy and practice between Joanna and Eric’s approach and the USDA, the costs are too high and the benefits too few. Dropping organic certification, part II goes into some of their specific issues with the certification. Concerns include costs, including the uncertainty of whether the government will continue the cost-share program; bureaucracy (why don’t chemical farmers have to track and report their inputs and applications?? ); and the degree of usefulness of USDA certification for direct marketing. As a CSA farm, Eric and Joanna are no longer competing for customers with self-proclaimed “organic” farmers at the market. Dropping organic certification, part III looks at the benefits of dropping certification, while acknowledging what they learned by being part of the certified system, specifically the value of good record-keeping, good compost-making and careful sourcing of inputs. They credit being certified (and needing to check potential herbicide use on hay and straw they brought in for feed and mulch) with helping them avoid the “killer hay” incidents which are, sadly, all too common around the country. They write about what they are looking forward to, freed from the certification restrictions. They are increasing biological diversity on their farm, getting off mailing lists (! ), and communicating more with customers and CSA members, know they’ll save time on certification paperwork. Finally, they discuss some of their regrets about no longer being part of “something bigger, a known collection of farms and consumers that stood for something different from the conventional agriculture model” they oppose. They will no longer have the support of USDA if they suffer from spray drift. They will no longer have an easy label to describe their farming practices to customers. Their hope is that more direct, personal communication with CSA members and the rest of the world will take over in addressing that need. Meanwhile, here at Twin Oaks, we’ve had More Snow. Only about 3″, following rain. But it has brought a halt to our outdoor gardening pursuits for a while. Just before the snow we managed to get some disking done – the first of the year! We had got some raised beds tilled a few days earlier, so we managed to prepare those bed and sow beets, turnips, radishes and scallions, as well as the last of the snap peas. We haven’t transplanted anything except lettuce, scallions and spinach, because it has been so cold. We got beds ready for kale, cabbage, senposai and collards, before I realized the plants were too small to go outside! All our transplants have been growing slowly. We have postponed planting our tomatoes in the hoophouse because the weather is so unsettled (which is a mild way of saying scarily cold). What’s still standing after two nights below 0F? Recently I reported on which crops were still alive after two nights at 14F (-10C) and What’s still alive after two nights at 4F? We’ve now had the Polar Vortex, which brought us two nights at 4F, on 1/6 and 1/7. Then it got even colder.We got the Big Round 0F 1/22-1/23, then a few nights at 5F or 6F, and then the big insult: -4F on the night of 1/29-30. The Tyee spinach under thick rowcover has sustained big damage, showing as patches of beige dead cells. It will recover. Meanwhile we can eat from the more-protected spinach in the coldframes and the hoophouse. 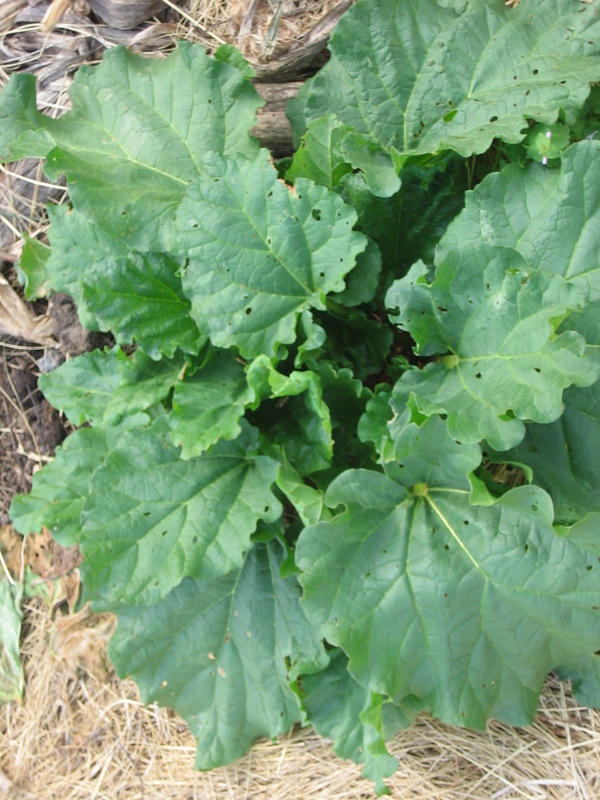 The Vates kale without rowcover is still alive, but badly damaged. The big leaves are crunchy and brown round the edges, and some of the inner leaves are dead. I hope it will grow back, but we won’t be able to pick that for a while. The Beedy’s Camden kale looks worse – the big leaves have died and flopped over. Not sure if it will recover. 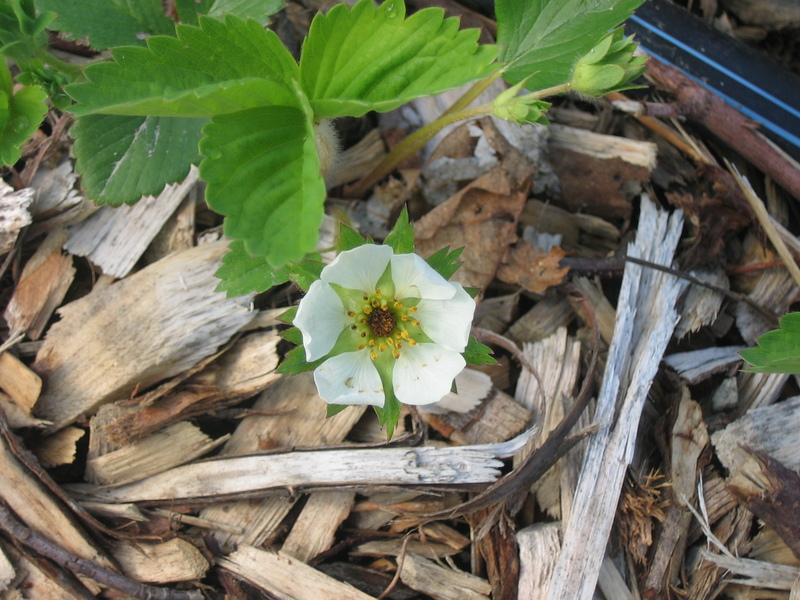 Many of our strawberry plants look dead – very disappointing! Our hardneck garlic and Polish White softneck tops are killed back to about one inch up from the mulch. Equally hardy, it seems. We had the remains of a lettuce nursery bed, still holding surplus transplants from September sowings that we didn’t need for our greenhouse or hoophouse. After the 4F assault we still had life in the centers of the Winter Marvel, North Pole, Tango, Green Forest. Now only the Winter Marvel shows any signs of life. So that variety gets the prize for cold-tolerance here! 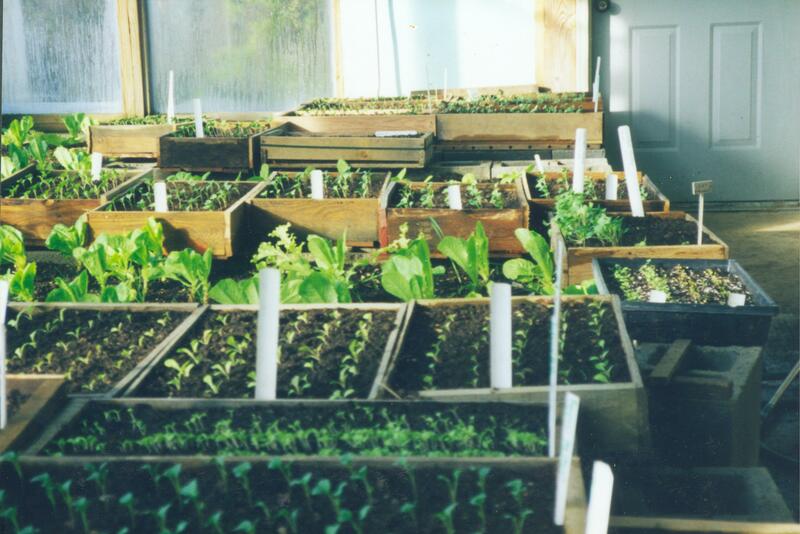 In the hoophouse, we covered all the beds with thick rowcover every night it looked like dropping below 10F inside. Almost everything survived – we only got some minor stem freezing on some turnips and Asian greens. We have been eating Pak Choy, Tokyo Bekana, Yukina Savoy, various turnips and their greens (Hakurei, White Egg, Oasis, Red Round), also plenty of lettuce leaves, radishes, scallions, and some spinach. We lost our second sowing of spinach in there to over watering and flooding, and we are really noticing the lack right now. We’re short on spinach. We have small amounts of mizuna, Ruby Streaks, Bright Lights chard, Bulls Blood beets to add to salad mixes, and Red Russian and White Russian kale growing slowly. In January we have taken to sowing spinach, kale and collards in a hoophouse bed to transplant outdoors in early spring. We back this up with sowing some in flats if we don’t get good emergence for some reason. This year emergence is late. Is it just late, or is there a problem? We’re holding our breath for a few more days. . .
We are not the only people tracking the effects of the unusually cold weather. 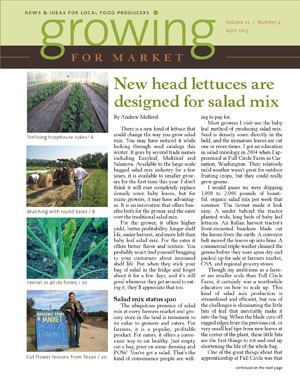 The February Growing for Market magazine opens with an article by Ben Hartman “Testing the Limits of Cold Tolerance”. He farms in Goshen, Indiana, using two double-layer plastic greenhouses heated to 30F (yes. I said heated!) and two unheated. They planted kale, carrots, spinach, salad greens and arugula in their greenhouses for winter harvest. Their outdoor temperatures fell to -16F on 1/6 and 1/7. I imagine they’ve had worse since. They used mid-weight rowcover over their beds. Ben reports that baby greens and young spinach survived, as did their rosemary and their 3 fig trees (all farmers deserve some thrills!). They lost baby salad greens that had already been cut previously (all those cut edges didn’t do well). Crops in the outer beds were lost. The tips of full-grown kale leaves froze, but the plants survived. 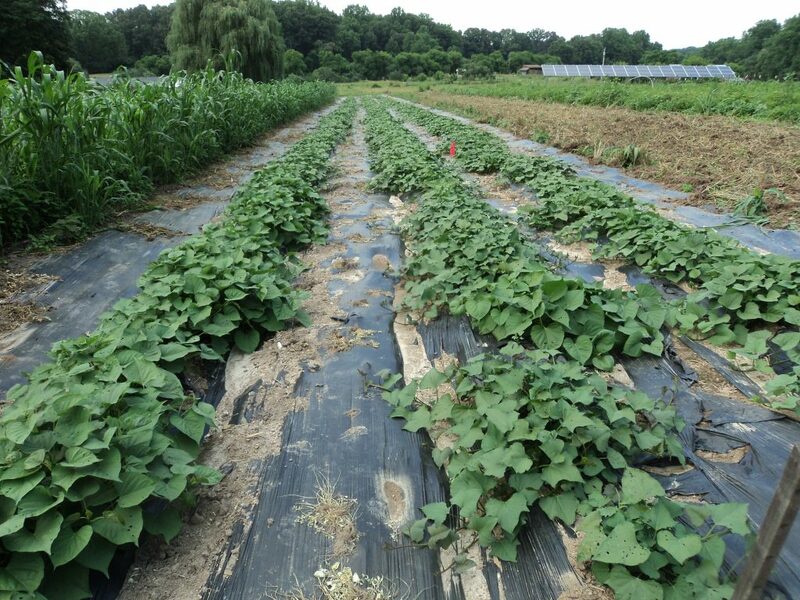 In their unheated, single-skin plastic hoophouses, the soil froze down to 4″. They used two layers of mid-weight rowcover suspended over the crops. 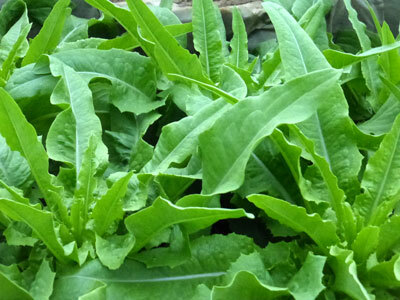 Despite this cold, tiny salad greens less than 1″ tall survived. Spinach survived under just one layer of rowcover. The carrot tops froze and the roots may or may not be marketable. The (uncovered) fully mature kale looks dead. The mature salad with two layers of rowcover didn’t survive. From this experience, Ben points out that salad greens and spinach less than 1″ tall are very cold-tolerant. Spinach and kale once larger, benefit from more protection than they got this time. Beware the outer beds! My own article in this issue is about matching crop spacing with desired goals, such as maximum yield, optimum size, or convenience for cultivation. 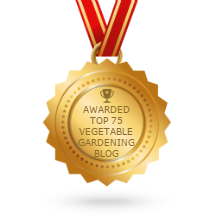 Andrew Mefford has written some greenhouse tips for hoophouse growers, including tomato grafting, trellising. 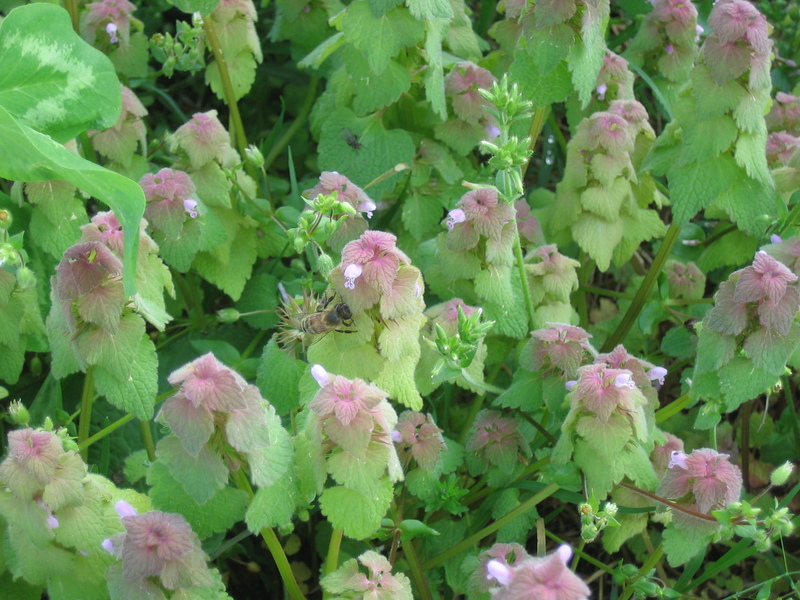 Chris Blanchard has written the second part of his piece on growing herbs – this is about harvest and maintenance. Erin Benzakain has undertaken a 59-variety trial of celosia. Author farmerpamPosted on February 4, 2014 June 20, 2016 Categories Articles, climate change, hoophouse, Lettuce varieties, This week in the gardenTags baby lettuce mix, Ben Hartman, Bulls Blood beets, Chandler strawberries, chard, Chris Blanchard, Cold-Hardy Winter Vegetables, deer eat strawberries, Erin Benzakein, ferny mustards, freeze damage, garlic tops grow back after being frozen, Green Forest., growing for market, Hakurei, Hakurei turnips, hardneck garlic, harvesting herbs, kale, lettuce, lettuce in hoophouse, mizuna, North Pole, Oasis, overwintering chard, pak choy, Polar Vortex, Polish White softneck garlic, radishes, Red Round turnips, Red Russian and White Russian kale, rowcover, rowcover for winter vegetable crops, Ruby Streaks, Russian kale, scallions, sowing in hoophouse to transplant outdoors, spinach, Tango, Tokyo bekana, tomato grafting, trellising, turnip greens, Tyee spinach cold hardy, Tyee spinach overwinter, Vates kale, Vates kale cold hardy, vegetable crops alive after -4F, vegetable crops alive at 14F, White Egg, winter hoophouse crops, Winter Marvel, Winter Marvel lettuce cold hardy, winter spinach, Yukina savoy1 Comment on What’s still standing after two nights below 0F? 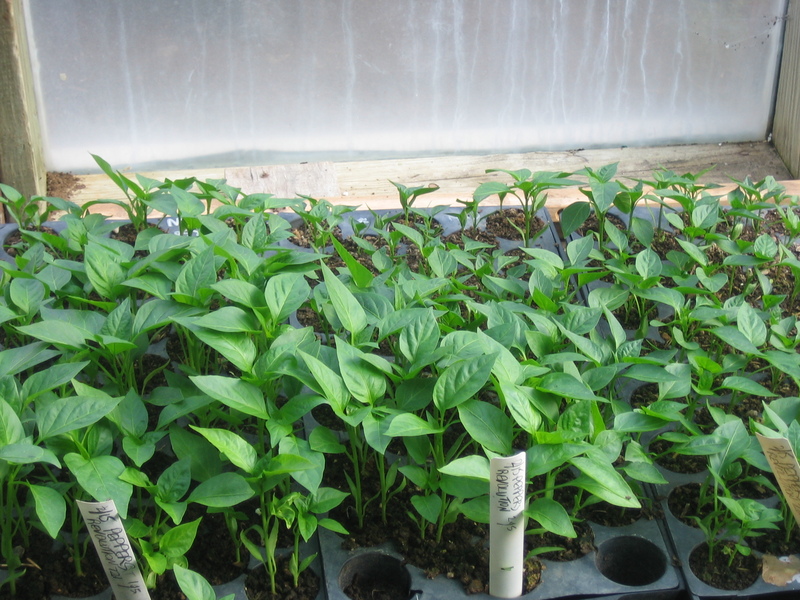 Pepper transplants waiting to be set out. At last we are getting our warm weather crops transplanted! We finished our 530 Roma paste tomatoes and I’ve just seen this afternoon’s crew of two go past the office window with watermelon starts on a cart. We’re late, but we’re getting there! We have about 260 Crimson Sweet watermelons to go in, and cover to keep the bugs off. This morning, working with the large crew, we set out the ropes and the sticks to hold down the rowcover. Our method is to use the big morning crews to harvest and to get ready whatever will be needed for the small late afternoon transplanting shift, so all they have to do is plant, water and cover. This makes best use of the cooling temperatures later in the day. After the watermelons, we’ll still have peppers, eggplants, muskmelons (cantaloupes), okra and lots of sweet potatoes to go in. And more lettuce every week. Meanwhile the brood II 17-year cicadas are in good form. So loud. The ground around the trees is riddled with holes from the emerging juniors. The cast-off shells/exoskeletons are crunchy underfoot. Someone here saw squirrels eating cicadas but I haven’t seen it yet myself. 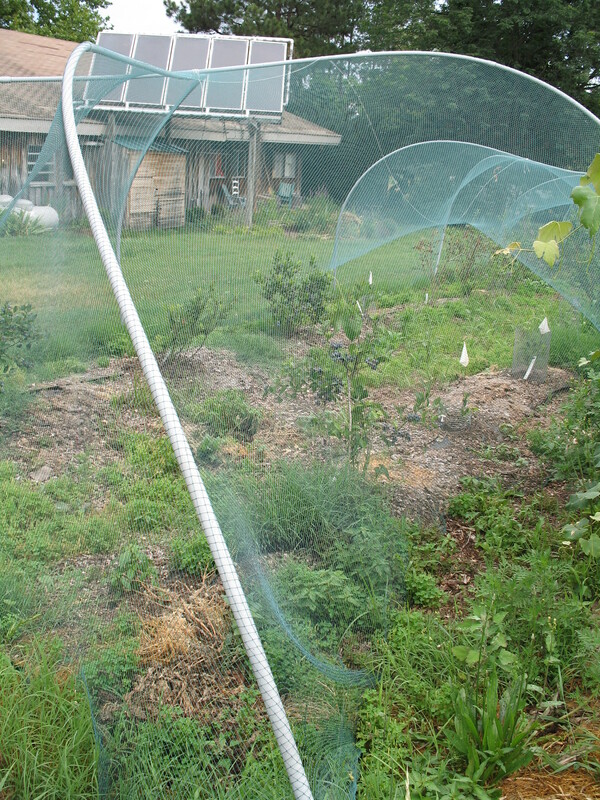 The other thing I want to write about is our blueberry netting and its seasonal hooped structure. I think this is a good method that more people might like to use. Our older blueberry patch has a rectangular framework made of posts with wires joining the tops. the netting is a fairly rigid square plastic type that is a challenge to put up. This new type is a big improvement – easy to put up and get the netting over, and removable so we don’t have to look at the framework all year. 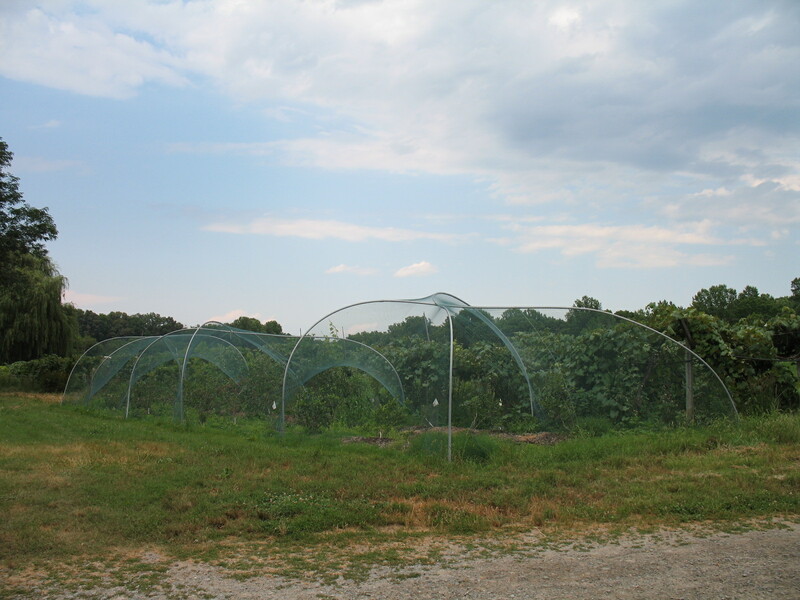 Our new blueberry area is 16′ x 65′ approx. The height of the netting supports needs to be 7′ or more for most of the space. The 20 blueberry bushes are 66″ apart, in two rows. Galvanized steel tubing, as sold for small hoophouses. Metal electrical conduit bent into a curve, connected at the ridge. Other tubing, such as chainlink fence top-rail, metal water pipe, curved. We chose PVC Electrical conduit. Plastic electrical conduit, unlike water pipe, is UV-inhibited for outdoor use. Lengths have swaged (flanged) ends, so can be joined without any separate connectors. Lightweight, no bending tools needed (unlike for metal conduit or fencing top-rail). Packs flat for out-of-season storage. Relatively cheap. We use a “Spider-House” temporary framework – an idea used for temporary “field hoophouses”. It consists of pairs of bows fastened together at the apex, in a way that spreads out into a 4-legged structure. A row of these make up the frame. An advantage is that the spiders are stronger than simple bows, and that the whole thing can be dismantled relatively easily. Helps add strength to lightweight bows. I’ll tell you how we did it, then talk about the options we didn’t choose. We bought very nice flexible nylon netting from Lee Valley. We chose the 12’ x 117’ ½” mesh, and I stitched two lengths together using nylon thread, making a piece 24’ wide. It should last a long time. It isn’t cheap. It does not ravel when cut, or snag on itself. At the end of the season it can be stuffed in a bag, with just one end poking out of the neck of the bag. Then next year, drop the bag at one end, pull the free end of the netting up over the piping and along the length of the berry patch. Our netting is longer than the patch, but we plan to extend the patch one day. . .
For our 16’ x 65’ patch, we decided on three “spiders.” Our calculation was that 30’ hooped into a half circle would have a diameter of 19’ (divide circumference by pi to get radius, then multiply by two). So we reckoned having the ends of each pipe 19’ apart, crosswise across the patch. A bit of Pythagoras leads to a spacing along the length of the patch of just over 10’ for a width of 16’ and a diagonal of 19’. We don’t need perfect half-circles, but we did need a rough idea of a workable length. We bought 18 pieces of 3/4” PVC electrical conduit in 10’ lengths with swaged (belled) ends. We glued them in threes to make 30’ lengths. We marked the center point of each length, matched centers of two lengths, then tied a pair of lengths together to form a cross shape. If you were in the scouts, square lashing is the type of knot you need. We got 12 4’ lengths of rebar and hammered them halfway in the ground along the long edges of the plot, 12’ 6” apart (six rebars, 5 spaces of 12’ 6” equals 62’ 6”). Close enough. We popped the spider legs over the rebar, making sure all the lumpy knots were on the underside of the tubing crossovers, to make it easier to pull the netting. When we had all three four-legged spiders in position, we pulled over the netting, and pinned it down every 18” round the edges with 1” wide sod staples/landscape pins. We have a doorway along the central seam, simply held closed with clothes pins. PVC water pipe. A small experimental structure at Twin Oaks, made from 3/4″ pipe collapsed in the winter, (but need not have). Cheap, easy to bend, easy to replace. Can install for seasonal use on rebar pieces in the ground (which could be an off-season hazard….). Using PVC glue is smelly and unhealthy. Not cheaper than PVC electrical conduit. See Constructing a Simple PVC High Tunnel by Jim Hail, Robbins Hail, Katherine Kelly, and Ted Carey for a 30’ x 18’ hoophouse from 1” PVC. There is a smaller design “Portable Field Hoophouse”, using 3/4″ rigid white schedule 40 pvc in 18′ lengths to give a 10′ wide frame for an 18-42′ length hoophouse with no ridgepole. Metal electrical conduit bent into a curve, connected at the ridge. Conduit is cheap and readily available. It can be bent with purchased pipebenders (if the right shape is available), or on a wooden jig, or round stakes hammered into the ground. Lost Creek sells pipebenders. Johnnys sells Quick Hoops Benders but they make 12’ x 7’ high tunnel or caterpillar tunnel hoops only. They have a video on the site. Other metal tubing, such as chainlink fence top-rail, or metal water-pipe, bent into a curve. Either use the commercially available pipebenders, as above, or make your own jig. There are good plans by Jamie and Tod Hanley using square tubing, and a home-made bending jig. Square is easier to bend without twisting, but that might not be important for this project. More plastic tubing (1” x 20’) hoophouse frames and a metal tubing frame as well as photos and details of a bending jig for metal water piping, on the New Farm website, using 3/4″ galvanised piping in 21′ lengths. Their jig consists of 20 short pieces of 2×4 lumber screwed down on the bed of a hay wagon. Pre-curved galvanized steel tubing, as sold for small hoophouses. Farmtek has a wide range of ready-made hoop parts, including tall, round-topped styles. Shipping adds to the cost. More expensive than other options. 20′ rebar inside PVC piping. Idea from Cindy Connor for small hoophouses. Stronger than PVC pipe alone. 5/8″ rebar could be used alone (but hard to pull fabrics over). Fiberglass poles fixed to T-posts. T-posts would stay all year, fiberglass poles stored out of season. Straightforward to do. Splinters from fiberglass could be a problem long-term. Wood-framed structure. A lot of work, but cheap. Clunky. Might take too long to make. Bamboo. Free if you have invasive bamboo, but a bit of work. The nodes would snag on the netting. Saw then sand them off? Duct tape? 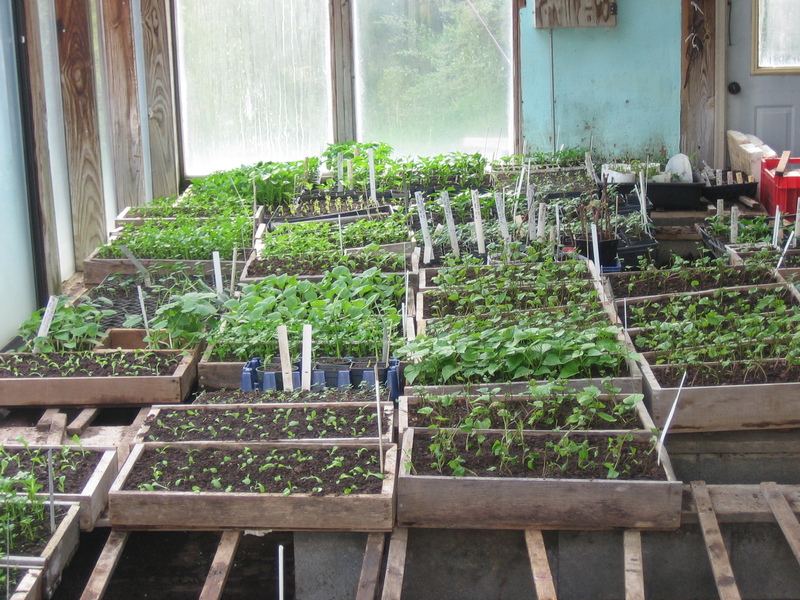 We’ve been starting seedlings since late January, and the greenhouse is filling up with flats of lettuce, cabbage, kohlrabi, spinach, scallions and broccoli. We’re eating our way through the lettuces that grew overwinter in the compost in the block-work greenhouse beds, and shoveling out the compost to fill our flats. 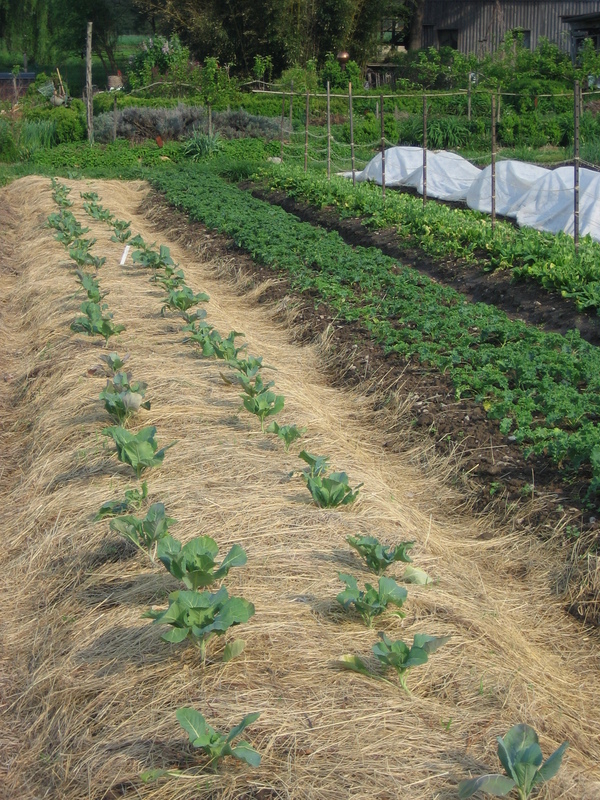 All our seedlings are grown in 100% home-made compost. We screen compost to fill the beds in September and transplant lettuce there in October. When we need the compost for the seedlings, it has mellowed nicely and has plenty of worms. This beats buying in bags of compost, or chipping lumps off a heap of frozen compost outdoors in January! 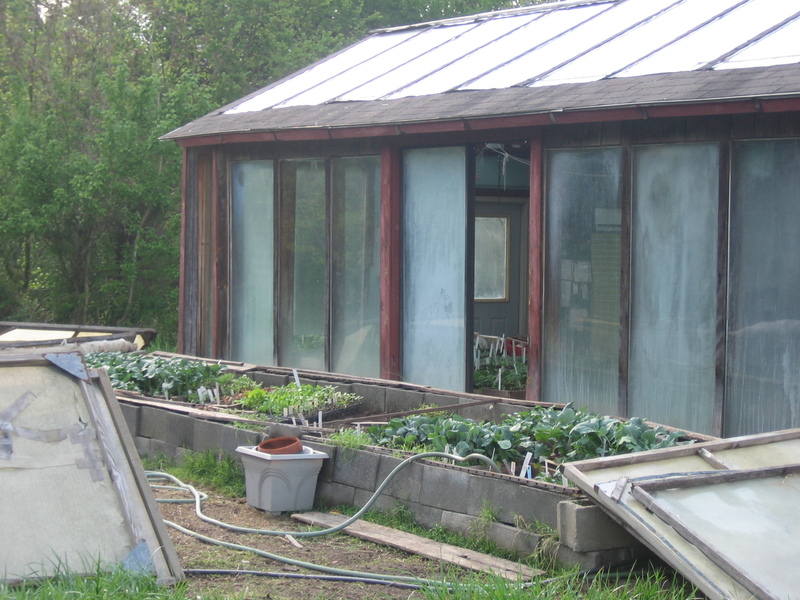 Our greenhouse has a masonry north wall and a patio-door south wall. It has no heating apart from the sun (this is Zone 7). This space is warm enough and just big enough for all our seedlings once they have emerged. For growing-on the very early tomatoes and peppers, destined for our hoophouse, we use an electric heat mat and a plastic low tunnel in one corner of the greenhouse. Many seeds benefit from some heat during germination and are then moved into slightly less warm conditions to continue growing. This means it’s possible to heat a relatively small space just to germinate the seeds in. We use two broken refrigerators as insulated cabinets, with extra shelves added. A single incandescent lightbulb in each supplies both the light and the heat (we change the wattage depending on what temperature we’re aiming for). Some people construct an insulated cabinet from scratch, with fluorescent lights suspended above the flats. We use traditional coldframes for “hardening-off” our plants (helping them adjust to cooler, brighter, breezier conditions). They are rectangles of dry-stacked cinder blocks, with lids of woodframed fiberglass. Having heavy flats of plants at ground level is less than ideal for anyone over thirty-five! Shade houses and single-layer poly hoop structures with ventable sidewalls and benches for the flats are a nicer option. Some growers report that some pests are less trouble when flats are up on benches. Others say flats on the ground produce better quality plants. 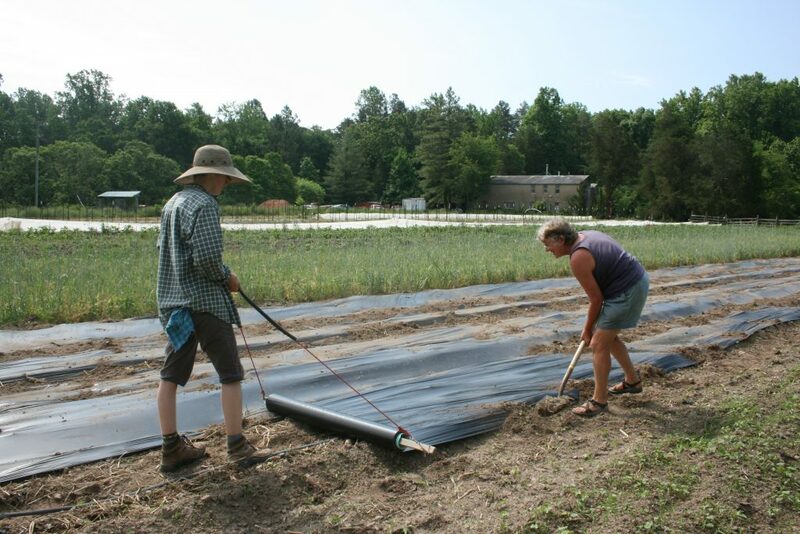 According to the nighttime temperatures, we cover the coldframes with rowcover for 32°F–38°F (0°–3°C), add the lids for 15°F–32°F (–9°C–0°C) and roll quilts on top if it might go below 15°F (–9°C). 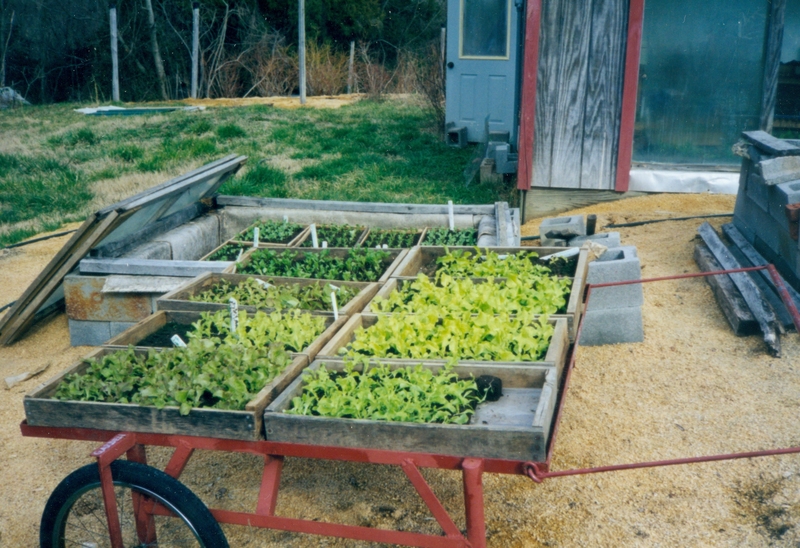 For brassicas, lettuce and our paste tomatoes (a big planting), we use open flats — simple wooden boxes. The transplant flat size is 12″ × 24″ × 4″ deep (30 × 60 × 10 cm). It holds 40 plants, “spotted” or pricked out in a hexagonal pattern, using a dibble board. 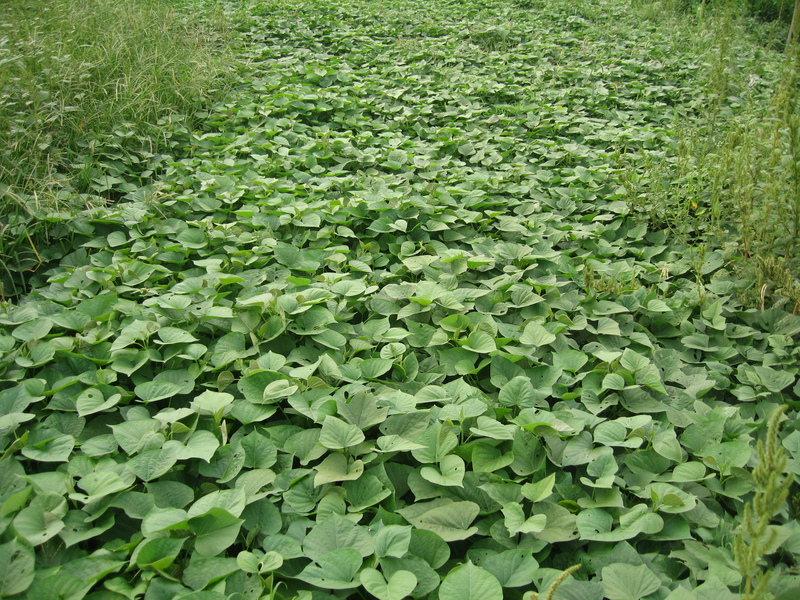 For sowing, we use shallower 3″ (7.5 cm) flats. 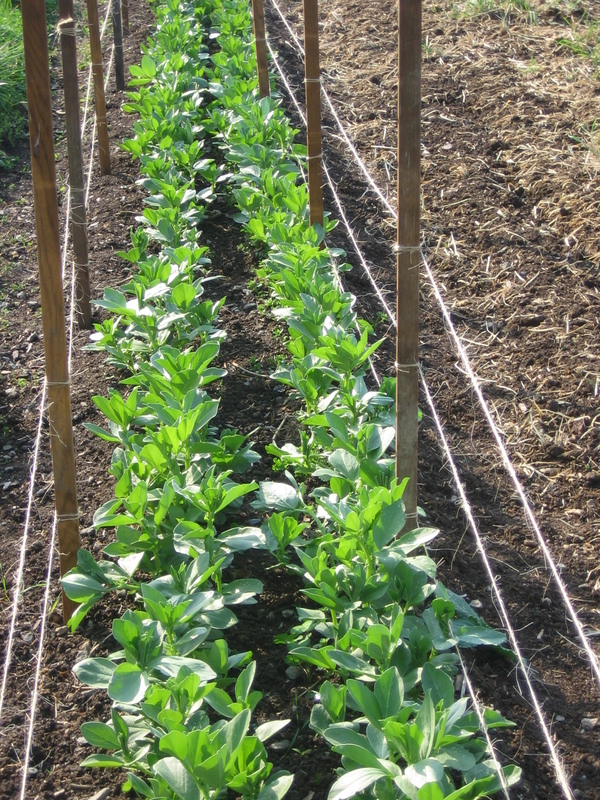 Usually we sow four rows lengthwise in each seedling flat. We reckon we can get about six transplant flats from each seedling flat. This allows for throwing out any wimpy seedlings, and lets us start a higher number of plants in a smaller space. Because we transplant by hand, and because we hate to throw plastic away (or spend money when we don’t need to), we use a range of plastic plant containers. For crops where we are growing only a small number of plants of each variety, we use six- or nine-packs, or a plug flat divided into smaller units. 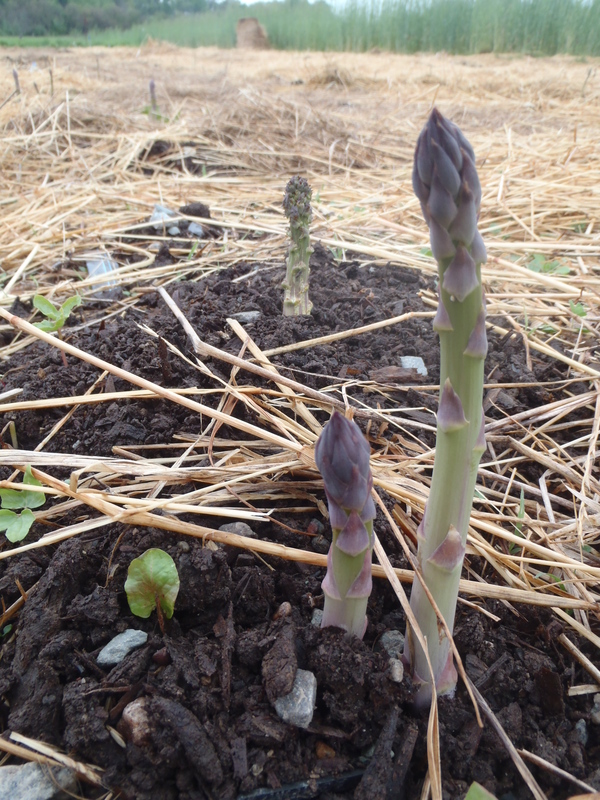 The first crops sown are not necessarily the first ones planted out. Our spinach gets sown Jan 24 and transplanted out 4 weeks later. The early tomatoes get planted in the hoophouse at 6 weeks of age (slower-growing peppers go in at 7.5 weeks with rowcover at the ready!). Lettuce goes outdoors after 6.5 weeks, cabbage after 7.5 weeks, cipollini mini-onions after 8 weeks. These are early season timings and as the days warm up and get longer, seedlings grow more quickly. 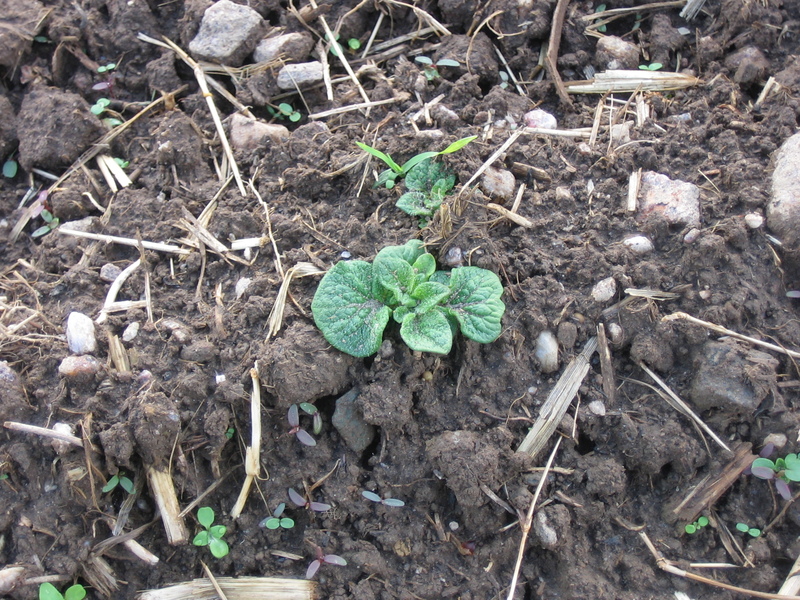 Being a few days later sowing something in early spring makes little difference, as later sowings can catch up by growing faster in the warmer weather. If the spring is cold and late, you may find your greenhouse packed to the gills with flats you don’t want to take outside. We try to put the faster-maturing crops near the doors and keep the open flats, which will need spotting-out, near the accessible north side. But let’s not complain about the bounty of so many plants! Spring is an exciting time of year, full of new growth and new potential. Working in the greenhouse with tiny plants on a sunny day when it’s cold outside is a special treat.